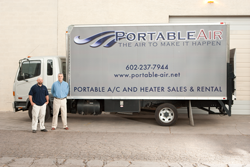 Portable Air, located in Phoenix, Arizona, rents and sells portable air conditioners, heaters, dehumidifiers, and air purifiers for temporary, emergency and permanent climate control applications. With offices throughout the Western United States, we set the standard for portable climate control rental and installation. Portable Air has over 15 years of portable air conditioning experience and has become one of the fastest growing companies in the industry. With a commitment to excellence we have expanded our dealer authorized product line to now offer an extensive selection for Kwikool, Heat Wagon, Dri-Eaz, and AirWorkx. With new Federal laws in air filtration and purification, we can provide top of the line air scrubbers and negative air machines for hospitals and contaminated job sites. We offer air-cooled, split system, and water-cooled portables to solve your temperature control situations. For those larger cooling or heating needs, Portable Air offers up to 30 ton trailer mounted, and vertical skid mount units, along with up to 1 million BTU indirect heaters to make your special event comfortable. Browse our site and find out today what Portable Air can do for you. We proudly provide 24-hour emergency service every day of the year.